Going to the doctor is not always fun. But waiting for the doctor can be worse. Much attention has been paid to wait times for military veterans seeking care at Department of Veterans Affairs (VA) medical centers across the country, and data from the VA show that wait times vary significantly among VA health care systems in Ninth District states. 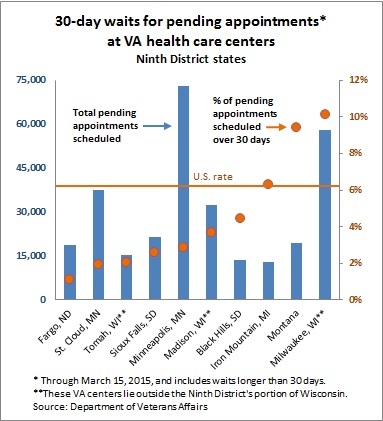 For example, the percentage of pending appointments that are scheduled more than 30 days after the preferred date runs as low as 1 percent (Fargo, N.D.) to 10 percent (Milwaukee, Wis.), according to VA data released this month for appointments through March 15, 2015. The likelihood of waiting also appears unrelated to volume; for example, the Minneapolis office, which had 73,000 pending appointments at 11 health centers across the state, has a lower average wait rate than Milwaukee, which has 58,000 appointments on the books at six facilities. Field facilities within a specific VA district also vary considerably. For example, at Montana’s busiest VA facility (Fort Harrison), nearly 16 percent of appointments are scheduled more than 30 days past the preferred date, while the rate is 4.4 percent in Billings. But again, volume isn’t necessarily the culprit. The Iron Mountain district serves the Upper Peninsula of Michigan. Its busiest facility (in Iron Mountain) had a 30-day wait rate of 5.7 percent, while the Marquette facility—with one-quarter of the appointments—had a wait rate of 13.2 percent.